Meteorologists and regular people still aren’t sure humans cause climate change. Weathercasters aren’t any better than the average American at understanding what’s causing this mess. Why? An all-time high of 65 percent of Americans now believe that human activities (as opposed to natural climate shifts) are responsible for global warming over the past century, according to the most recent Gallup survey. This number has increased steadily (though still depressingly slowly) since Gallup started asking about it, in 2001. Of course, this is low compared to scientific consensus. (More than 97 percent of actively publishing climate scientists agree that humans are responsible for most if not all or even more than all of climate change—that last bit a reference to the analysis that without us, the world would be cooling slightly.) But it’s right on par with one group of scientists: meteorologists. Last month, a new survey of members of the American Meteorological Society confirmed as much. 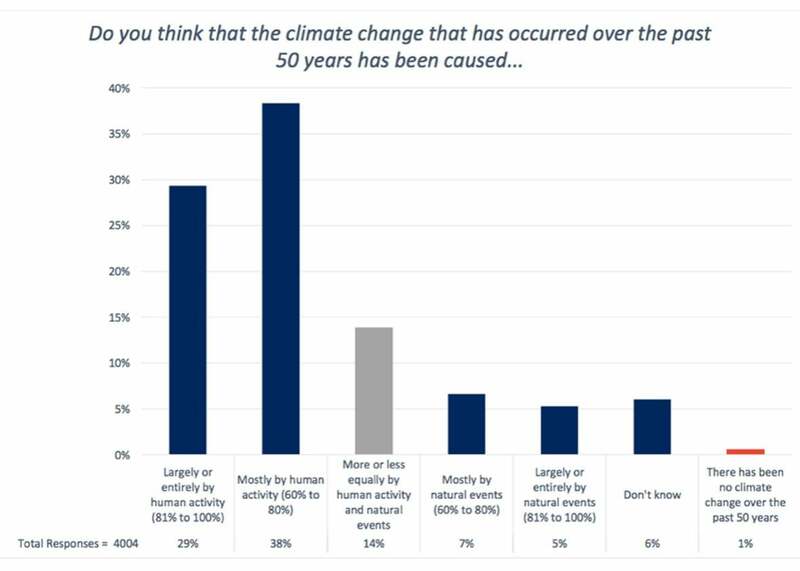 It turns out that just about an equal percentage of meteorologists accept that human activity is the primary cause climate change (67 percent) as the general public (65 percent, from the similarly worded Gallup poll). That new survey found just 29 percent of AMS members agreed with the stricter wording of the scientific consensus that climate change has been caused “largely or entirely by human activity.” This intense skepticism is worrying: Some of these meteorologists have big audiences that trust them for life-and-death advice during extreme weather. That they choose not to link those events, when appropriate, to human actions is a disservice to their science and to those who depend on them—and in fact, it may partially explain the public’s lack of acceptance of climate science. Strangely, news headlines surrounding this new AMS survey reported the results as if they were promising: “Meteorologists overwhelmingly conclude climate change is real and human-caused,” read the headline from the Washington Post’s Capital Weather Gang, a clearinghouse for meteorological reportage. Yes, it’s true that the latest numbers are an improvement over a similar survey four years ago (which was also roughly in line with Gallup at the time, showing that 52 percent of respondents agree that humans are at least half-responsible for climate change), but the headline result these reports picked up on—that 96 percent of respondents think climate change is happening—is moot. Even the snowball-throwing Sen. James Inhofe agrees with that—and he’s “not a scientist.” So how can these actual scientists be so far afield? And in fact, those footprints have been taken to heart. With the release of a new National Academies report last month, this mantra may be changing. Events like heat waves almost certainly bear a human imprint, the report said, and many droughts and heavy rain events do, too. So it’s time for meteorologists to step into the present of accepting that the weather right now may in fact be significantly more extreme because of us humans. Another reason for the low acceptance rates may have to do with who AMS members actually are. One thing they’re not is all formally educated meteorologists—they’re involved in a variety of weather-related fields (like local emergency management or teaching high school science). Just 32 percent of respondents held a bachelor’s degree or greater in meteorology, and only 37 percent considered themselves experts in climate science. And meteorology degrees may not even help, as they typically do not require coursework in climate change science—though of course that shouldn’t stop meteorologists and weather communicators from accepting the consensus of their more rigorously climate science–focused colleagues. Additionally, respondents also skewed older (62 percent over age 50) and strongly male (82 percent), roughly in line with AMS membership. Previous surveys have shown that’s also the demographic most likely to be skeptical of mainstream climate science, partly because of a bias known as the “white male effect”—the group is less risk averse than the general public. Add to that the fact that television meteorologists—which are just around one-fifth of overall AMS membership—have a vested interest in not alienating the politically conservative portion of their viewership. This leads to self-censorship. During that ridiculous Christmas Eve heat wave last year, a comprehensive review of local newscasts found that only one meteorologist mentioned a connection to climate change on air. And beyond not wanting to isolate viewers, many meteorologists may be less willing to accept climate change’s cause based on their own ideological inclinations. Political ideology is a leading indicator of whether or not AMS members accept mainstream climate science. A few vocal conservative meteorologists like James Spann and Roy Spencer regularly discuss their skepticism of climate science. (Spann has more than 250,000 Twitter followers and Spencer occasionally testifies in front of Congress.) 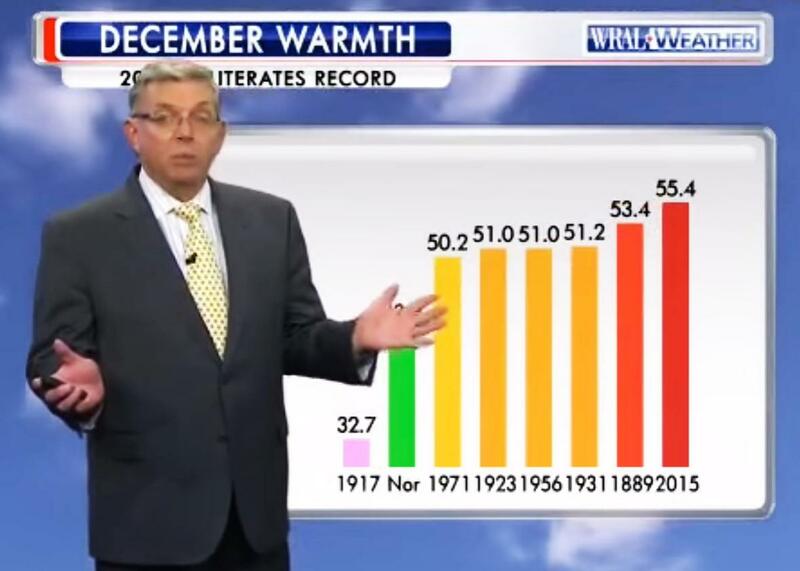 Politics has influenced the science so much that at least one meteorologist—Raleigh, North Carolina–based Greg Fishel (coincidentally the only one that correctly linked the Christmas Eve scorcher to climate change)—has publicly renounced the Republican Party in order to distance himself from the anti-science views of right-leaning politicians. Politically conservative meteorologists, like Spann and Spencer, have made great contributions to the science and are brilliant minds—but their doubts about the causes of climate change are magnified because of their large platforms. Still, there are many meteorologists who clearly align with climate scientists on this matter, and do manage to frequently discuss climate change in their daily weathercasts. South Carolina–based Jim Gandy, Florida-based John Morales, and Michigan-based Paul Gross all frequently do so. * The Weather Channel, which is based in cherry-red Georgia and caters to an increasingly graying audience, has devoted significant energy to engaging conservative weather enthusiasts on climate change, though it still generally shies away from incorporating climate science into daily weather reports. Plus, the AMS’s leadership team has explicitly endorsed the scientific community’s consensus that humans are unequivocally causing climate change. But that doesn’t mean all its members follow suit: “AMS is not monolithic in viewpoint [on human-caused climate change] nor should it be,” says Marshall Shepherd, past president of the AMS and a contributor to the National Academies report. He says that in general, meteorologists (himself included) are conservative on making absolute linkages on human-caused climate change, and the wording of this particular survey question may have thrown many respondents off: “If the question is asked ‘Is climate change caused by humans?’ I would likely answer that no. … However, if asked ‘Are human activities contributing significantly to changes in climate?’ I would likely answer that yes.” That’s a confusing response to what was perhaps a confusing question, but it highlights the world of meteorologists where everything is couched in probabilities and percent chances. On a day-to-day level, most meteorologists are still uncomfortable with discussing how human activities are shifting the odds of individual weather events. Again, that doesn’t mean humans aren’t to blame for climate change, but it explains how a group that is meant to focus on more real-time events that are just starting to be accepted as human-caused could lag behind. Thankfully, there are groups like Climate Central, whose Climate Matters program and WxShift website is designed to directly engage with television meteorologists on the link between weather and climate science. Bernadette Woods Placky, who runs the Climate Matters program, says they’re currently providing on-air–ready graphics support and educational materials to 300 of the 2,200 television meteorologists nationwide, and that number is growing sharply.